PREMIUM TEA TREE OIL - 100% Pure & Natural Essential Oil Therapeutic Grade- The best Tea Tree Oil on the market produced through steam distillation of fresh leaves. This versatile oil can be used in your beauty routine, home remedies, and much more! 4 ounce bottle! WORKS OR YOUR MONEY BACK - Our Guarantee: We back our products up with a LIFETIME hassle-free money back guarantee, no matter where you buy our product. There is absolutely no risk to you when you order now! If you are not completely satisfied, simply contact us and we will give you a full refund, no questions asked (you do not even have to return the bottle). Our #1 priority is to make sure our customers are completely happy. MOST VERSATILE ESSENTIAL OIL - Helps heal and soothe sunburns. Heals skin infections naturally and helps to prevent lice naturally, just add a few drops to your shampoo. A few drops in your pets' crates or beds keep the fleas away. Has been found as an effective treatment for warts and soothes insect bites. Treats ringworm and is great for removing ticks. PREMIUM QUALITY MELALEUCA OIL - Best home remedy for skin tag removal, acne, dandruff, toenail fungus, yeast infections, cold sores, ringworm and more! Great to mix with carrier oils such as Radha's Fractionated Coconut Oil to relax and soothe sore muscles. Another benefit is that it has a pleasant aroma and opens the sinuses and bronchial tubes for easier breathing, which results in deeper relaxation. Tea tree oil can be used in facial massages, mix with Radha Miracle Retinol Moistorizer and apply to your face to protect against the bacteria that causes acne. WORKS WONDERS AS A NATURAL ANTISEPTIC- Great to have in your first aid kit.Tea tree oil is an essential oil that is soothing, detoxifying and cleansing for the feet, and it is very effective in soothing sore, tired feet after a long day. Because it has antifungal properties, it also helps to prevent and eliminate athlete's foot when it is used regularly as part of foot massages. Before massaging your feet with this oil, make sure that your feet are clean and that you use Radha Beauty's Fractionated Coconut Oil as a carrier oil for the tea tree oil. It only takes a few drops of tea tree oil for it to be effective. Radha Beauty's Tea Tree Oil is amazing! There's so many uses, the list is endless. I love to use Radha's Tea Tree Oil in my homemade liquid laundry detergent. It makes my laundry smell great and disinfects everything in the wash. I also love to add it to my homemade household cleaning products. I love the smell and love knowing I'm able to disinfect without using harsh chemicals. I've also added Radha's Tea Tree oil to my shampoo to help rid my scalp of dandruff and it's worked like a charm. Now that it's heating up the mosquitos are out in full force and they love me, so I always get eaten up by them. To make matters worse I'm allergic so I get huge welts that itch like crazy. I've started rubbing Radha's Tea Tree Oil on the bites and the itching it gone. If I treat them early enough I don't get welts either. I've also heard it can be used to soothe sunburns, remove warts and skin tags, as a mouth wash, to clear up ringworm and much much more. I love Radha's pretty blue bottle and that the dropper is high quality. Radha's Tea Tree Oil comes in a large 4oz bottle and lasts me quite a while, which is pretty good considering I use it on a daily basis. 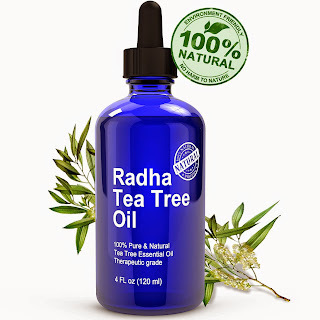 Click HERE to purchase Radha Beauty Tea Tree Oil on Amazon. WITH 2.5% ACTIVE RETINOL - This powerful cream will diminish the signs of aging with a 2.5% of active retinol while leaving you skin soft and smooth. 71% ORGANIC - contains natural ingredients such as Organic Aloe, Green Tea, Jojoba oil, Shea Butter for healthy skin. SUPER MOISTURIZER - Will moisturize and hydrate your skin leaving a radiant glow. Radha Beauty's Retinol Moisturizer is a great product that actually works! My skin is usually dry and flaky but after a few days of use my skin looked bright and healthy. I've now been using it a few weeks and my skin has continued to look better and better. I love that my skin has a natural glow now without makeup because my skin is so healthy thanks to Radha Beauty's Retinol Moisturizer. My skin also feels baby soft and my fine lines have softened. I truly love this product! 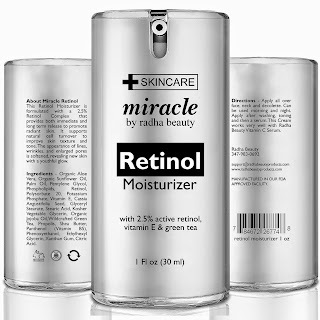 Click HERE to purchase Radha Beauty Retinol Moisturizer on Amazon. The product was brought for my daughter this is her second bottle she love. She had bad breakouts and acne scars.Since she start using this product I saw significant improvement.There is no more acne and the scar have diminished completely.